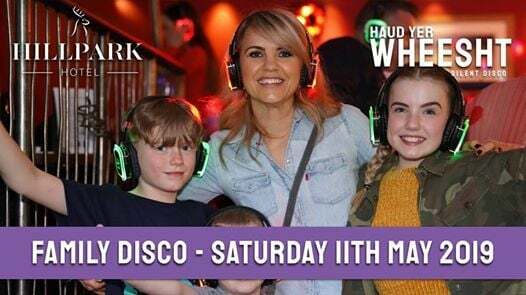 Join us at our first Family Silent Disco at Hill Park Hotel, Rosyth on Saturday 11th May!! From 5 till 7pm our Haud yer Wheesht! 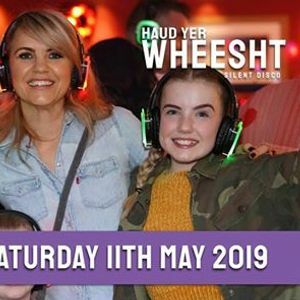 DJ will be in the mix over 3 channels of silent disco with party anthems suitable for all ages to party together... kids, parents and the grandparents too! Tickets are on Sale Now! at the venue, on the Facebook event page and on Eventbrite.com. On the night a £10 cash deposit is required for each headset, refunded when headsets are returned at end of party. Group bookings of more than 15 tickets need only pay one £150 security deposit. Other Family party date lined up at Hill Park Hotel in 2019… Saturday 21st September!! AND… ADULT ONLY parties (18+) on the same nights as both family events from 8pm till midnight. Save the dates guys, tickets on Sale Soon!